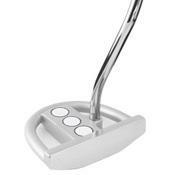 Made from Stainless Steel, the head has been designed to make aligning the putter head as easy as possible. The 'Half Moon' design provides a fantastic visual aid to the golfer to make aligning the blade as easy as possible.Three white dics sit on top of the putter to provide another aid for aligning the putter. When addressing the ball these sit directly behind the golf ball and make an easy reference point for aiming. This year I purchased at a sale – I think it was directgolf.co.uk – among some other items a Jaxx Half Moon putter for just 5 GBP. I am an amateur club builder who plays with Dynacraft woods (JackarooII) and irons (pc3) and I also have a few putters from that company, now Hirekogolf. But none give the feeling of the Half Moon putter. It is slightly heavier than most of my putters. Not as heavy as a Heavy Putter, but heavy enough to help me make a true pendulum stroke. And although it has no insert it still has a very soft touch, softer than any of my putters. At just 5GBP, it’s truly a bargain!